Multiple Working Postures - The 501-29 electric height-adjustable frames enable users to sit, lean or stand during their daily work. Transitioning between these positions encourages greater activity in the work place, bringing associated health benefits as workers are able to move away from a completely sedentary environment. 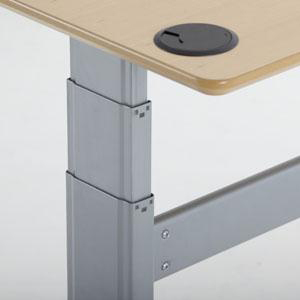 Infinitely Adjustable, Effortless Height Adjustment - The base provides infinite adjustment of height from 25" to 51", allowing users to quickly and precisely adjust the worksurface to the optimal height for the desired workstation configuration (sitting, standing, or anything in-between). 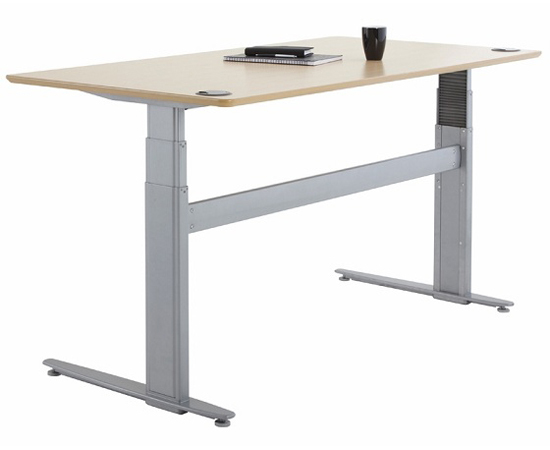 Accommodates Even Very Tall Users - The range of adjustment is sufficient to accommodate even very tall individuals, sitting or standing, up to 6' 10". Attractive Modern Styling: The slim legs have contemporary styling and are powder coated in an attractive Silver. 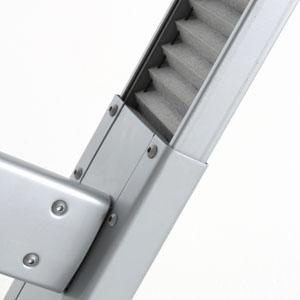 Triple Nesting Columns: The nested telescoping legs provide over 26" of height adjustment with minimal effect on stability even when at maximum height. 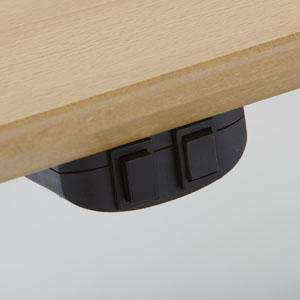 Adjustable Feet: The base includes that are adjustable, to ensure the base is level and to compensate for imperfections of the floor. Be sure to consider your height as you position your desk. Be aware that the height of your heels and even the time of day will affect your standing height. (Most people will be 2-3 cm shorter at the end of a day than at the start.) Ensure that you adjust the desk accordingly to achieve a neutral posture. Consider an anti-fatigue mat. 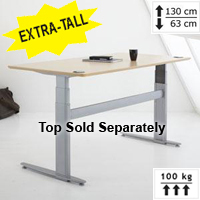 Many users find that standing is actually tiring, especially so with the hard-surfaced floors on which most people work. The short nap carpet that is common in many office or retail environments does little to mitigate the rigidity of the concrete it usually covers. A good anti-fatigue mat can leave you much less fatigued at the end of the day as it encourages flexing of the feet and lower leg muscles. If you wish to regularly switch between standing and sitting you will want a mat which can be easily moved when transitioning between the two positions. Try leaning. 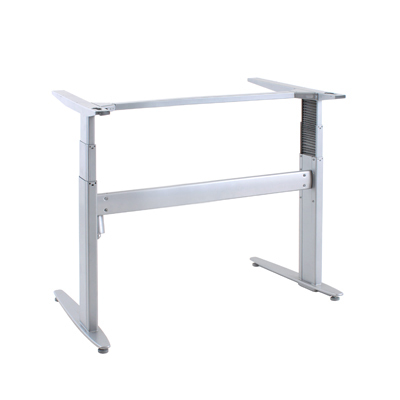 If you discover that you like working in an upright position but find that extended standing fatigues your body you may wish to consider one of the many sit/stand or 'leaning' options designed for working at elevated desks. These reduce the load on your feet by letting you transfer the majority of your weight to the seat. This 'almost upright' stance provides most of the mobility and range of movement that standing offers, while reducing the risk of fatigue. The leaning position also helps you transition effortlessly to a standing position. 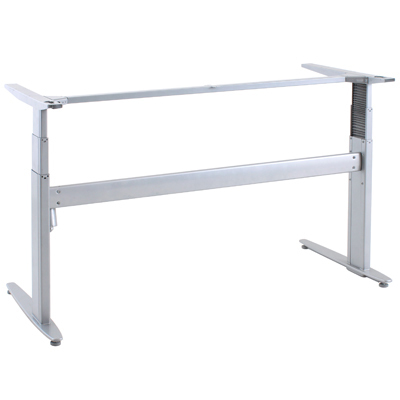 For available options, visit our Seating for Sit-Stand Workstations category.